I have a number of different illnesses, disabilities and conditions - most of which are largely invisible. You may see me with my crutches or sat in my wheelchair but that's there's so much more going on underneath. Pain, fatigue, dislocated joints, breathlessness, brain fog is all happening and a whole lot more. Most of my symptoms overlap and my illnesses and conditions interlink. For example if I have a seizure it causes my joints to subluxtions/dislocate and the energy a seizure takes flares up my M.E. as well as exacerbating my pain and fatigue levels. Another example is how my gastro issues are caused by several of my different, so it can be hard to work out what is causing what. 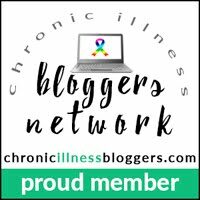 There is a lot of cross-over in symptoms such as many of my illnesses cause pain, fatigue and cognitive dysfunction among others. Some of my symptoms are constant and others are episodic. My health is very unpredictable and I can know from one hour to the next on how I will be.